Get COURSE FEES Instantly from NeST Campus! Technology Enhanced e-learning Techniques. Industry-institution interaction programs with Industry experts and Corporate leaders. 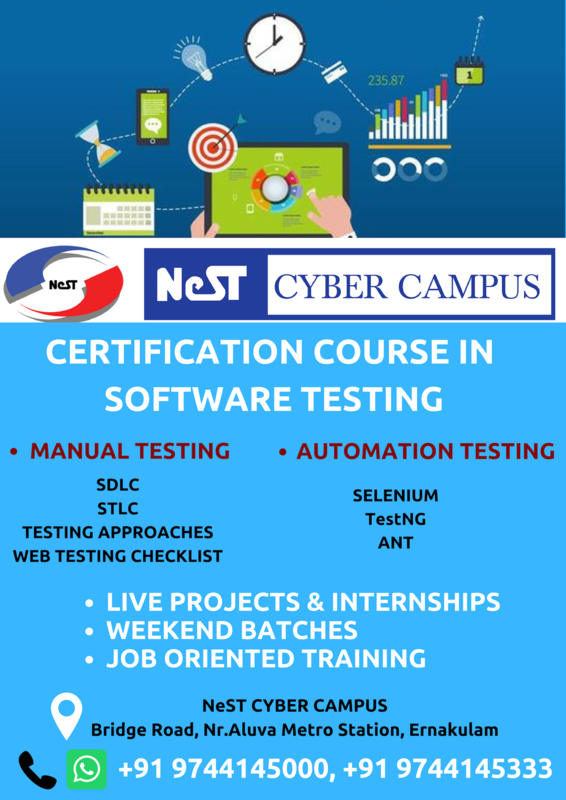 The software Test Professional profession is one of the critical job position where leadership ,management and strategy converge.During the course ,hottest topics in the industry are covered including agile testing ,performance testing,test automation ,mobile application testing, and test team leadership and management.Attending this course will help you to meet your professional career goals and give you the opportunity to improve your software testing techniques.The course content included Brief introduction to software systems and SDLC-,Basic Testing Vocabulary-Quality Assurance versus Quality Control-The Cost of Quality-Software Quality Factors. Testing Constraints Life Cycle Testing-Independent Testing-QA Process. Validation-Static versus Dynamic Testing-Examples of Specific Testing Techniques.